I have something to say, “I Love Bow Ties!” and I love matching them to an event! Women luck out with accessories. 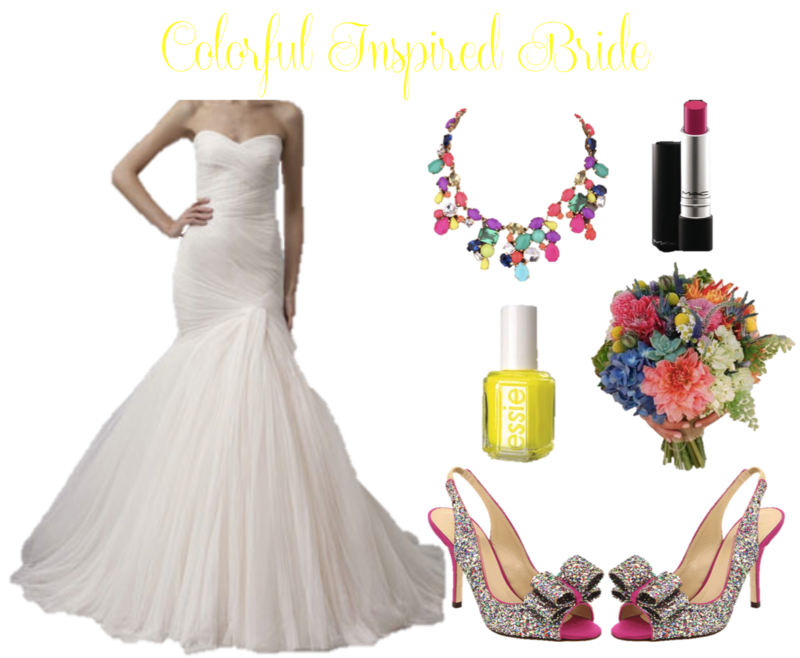 They have handbags, earrings, necklaces, and shoes that they can use to subtly and creatively coordinate their outfit to match with a specific event! Well, I get bowties! and that’s why I love them! Let me show you! See, I told you I loved Bow Ties! The episode challenged the contestants to design looks with bow ties in mind! 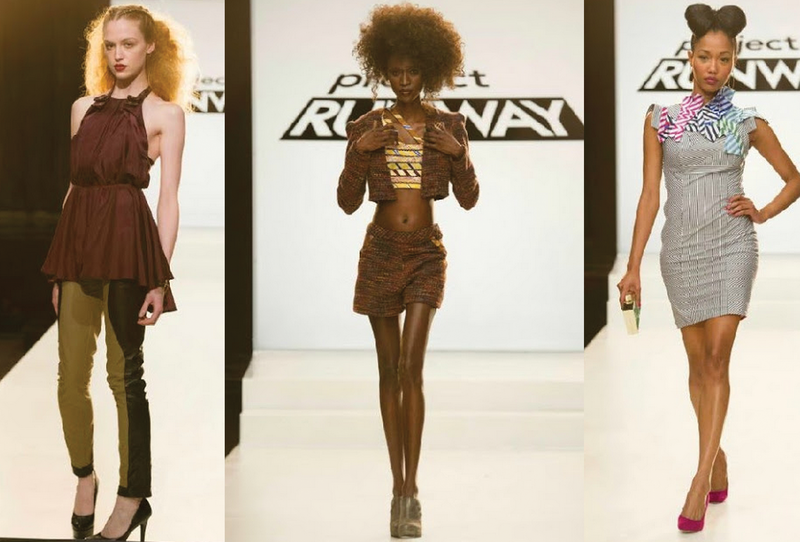 These were my favorite designs! The guest judge for the episode was Jesse Tyler Ferguson from Modern Family. He and his fiance started an organization called “Tie the Knot,” which designs and sells bow ties. All proceeds from the sales then go to organizations that fight for marriage equality, a cause very dear to my heart! ;) It’s also National Bow Tie Day tomorrow! No lies! We are now entering the fall fashion season… This is one of my favorite seasons because it is the beginning of all the holidays. Every month is something. Labor Day, Halloween, Thanksgiving and Christmas and there are a lot of parties and events in between for each of those holidays. That’s a lot of bow ties to get! So, what should you girls and boys wear for the next four months of holidays? Well, let “Tuesdays With Tim” help! 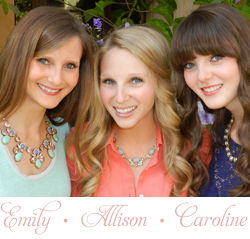 It is Ruana week for www.millyandgrace.com because our online boutique is featuring brand new colors and styles. 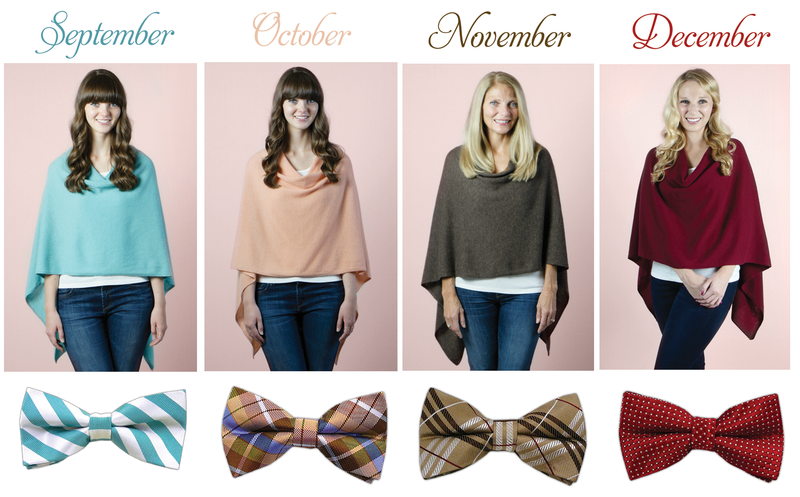 Ruanas are the perfect choice for your holiday outfits because they are so versatile and come in an array of colors! 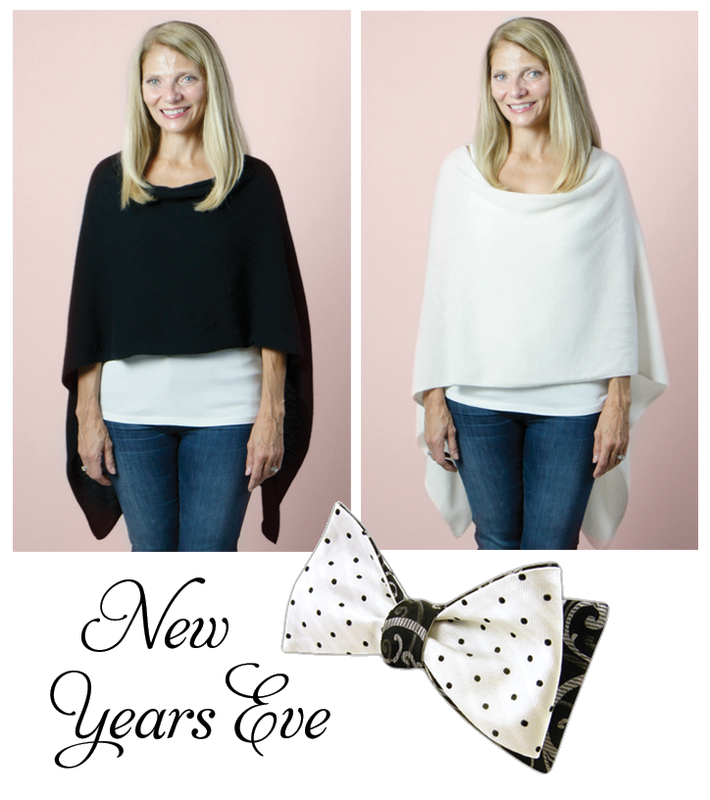 Well, I think it is always so attractive when couples subtly coordinate their outfits, so I paired a bow tie for the guys with each ruana for you ladies! 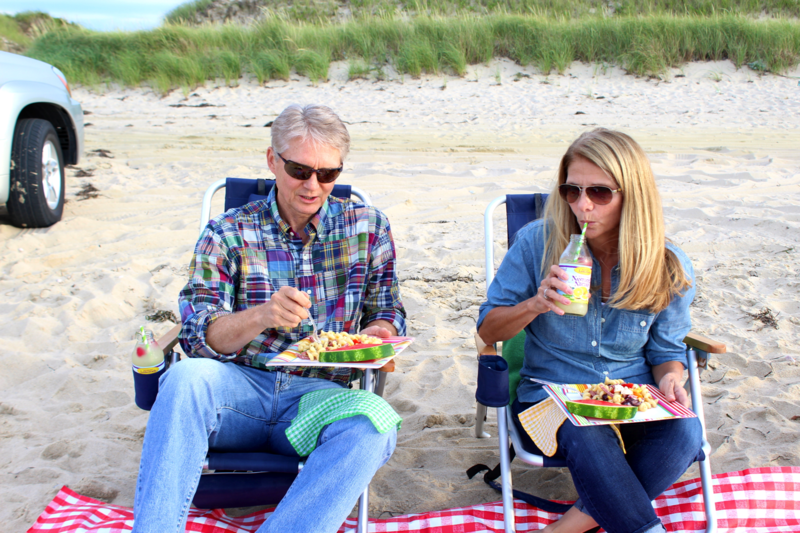 Summer is almost over and it’s beginning to feel a little bit like fall on Nantucket. Fall and winter are my absolute favorite seasons so I’m pretty excited about it. But, I am a little sad that summer is almost over. 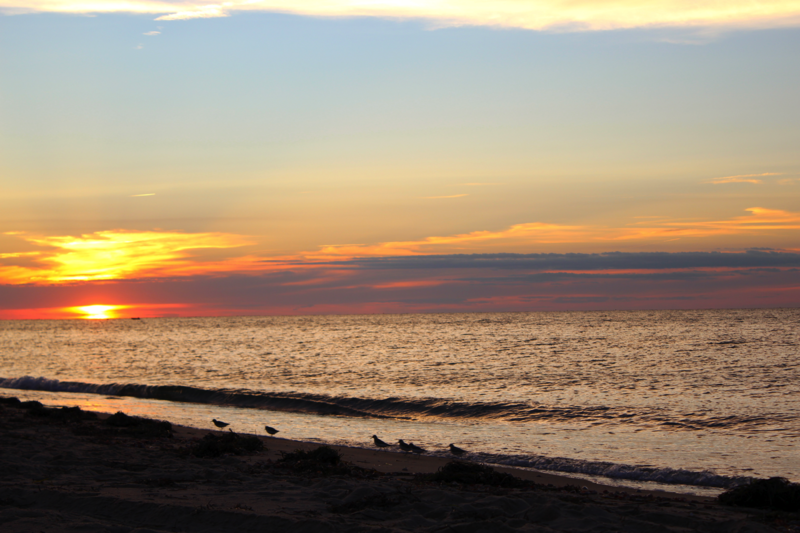 Especially because it means that it’s almost time to leave Nantucket and my family. 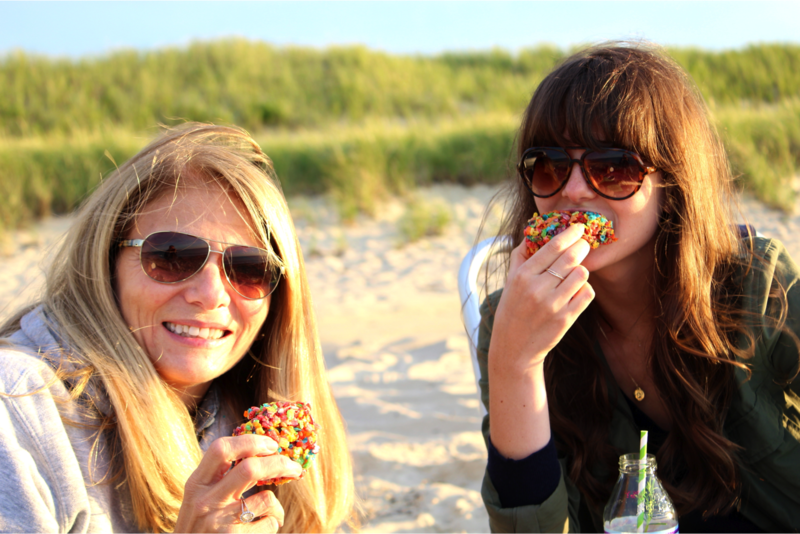 So, we have been savoring every last second of summer and our time together. 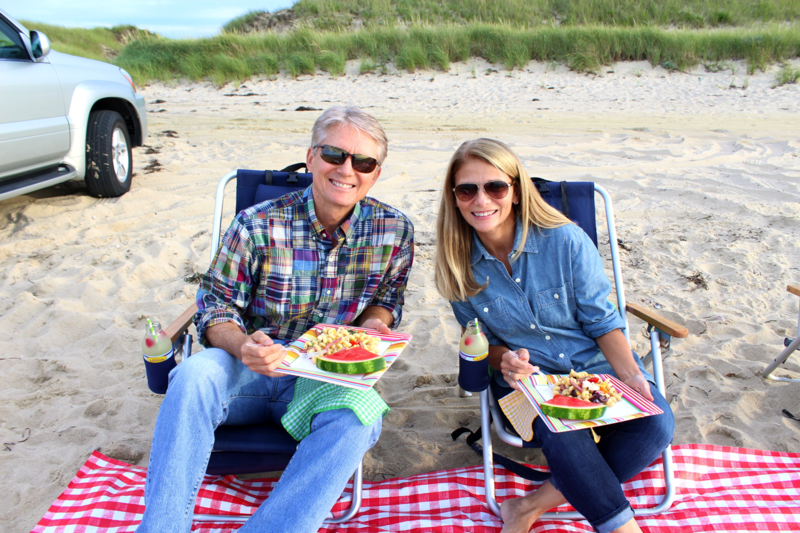 As you probably already know, my favorite thing to do in the summertime is pack up a picnic and eat dinner on the beach just in time for the sunset. We have been much better about doing that a lot this summer. And that makes me very happy! I sure am going to miss summer nights like these. 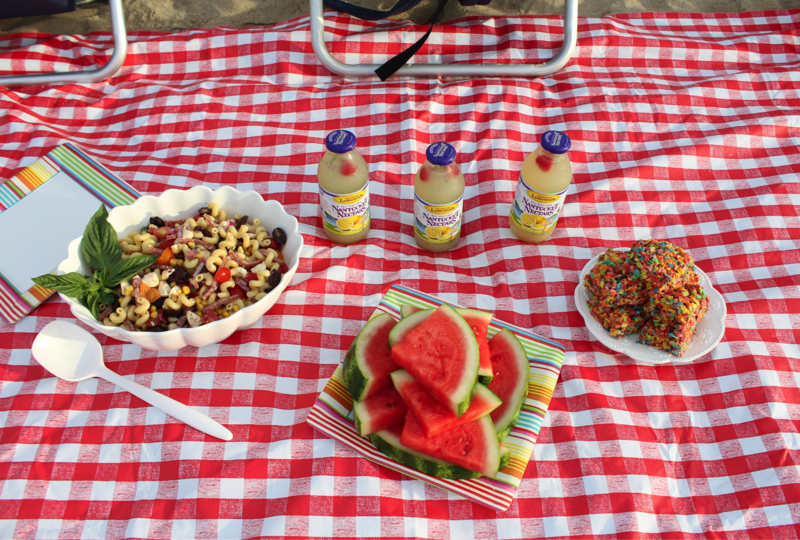 On our most recent beach picnic, I spruced up a lemonade with rosemary and raspberries, made my pasta salad and whipped up Fruity Pebble Treats (just like rice krispie treats but with fruity pebbles..amazing!). 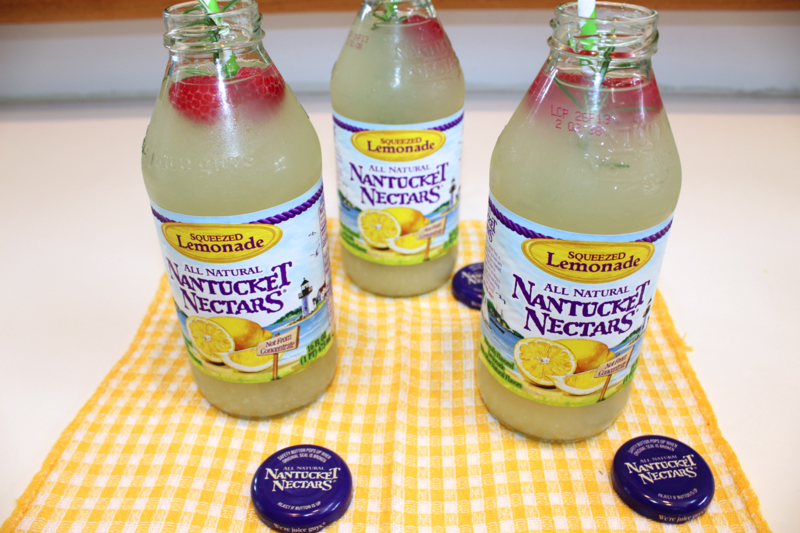 For the lemonade, I like to buy the individual bottles of lemonade because they can then act as a shaker. 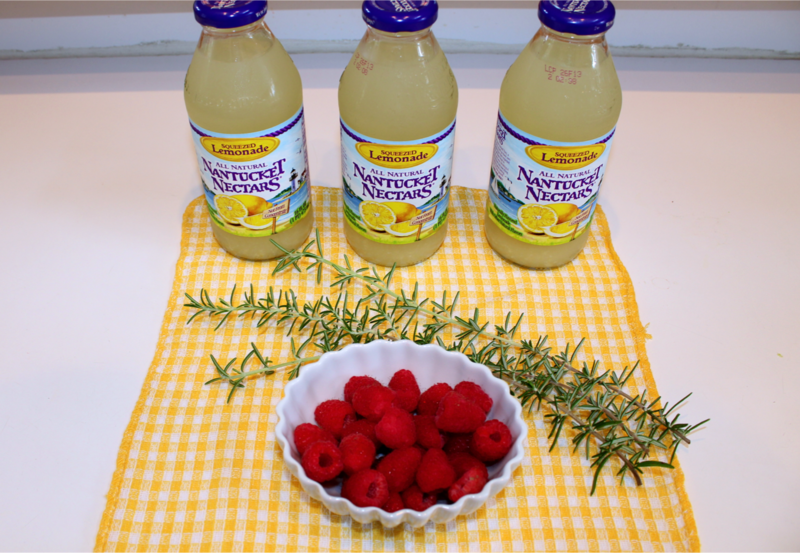 All you do is put a sprig of rosemary inside and a few raspberries, shake, and enjoy! 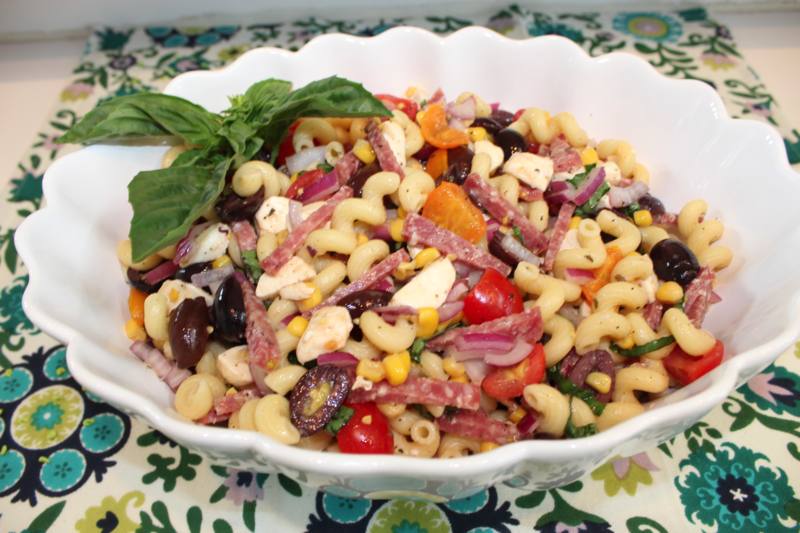 I used to make this pasta salad all the time for my school lunches in high school, and I thought it would be the perfect summer picnic meal. 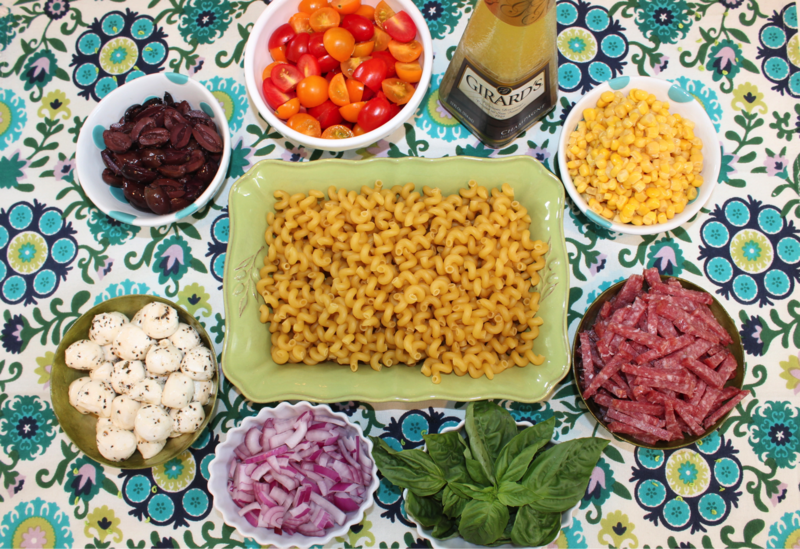 I put tomatoes, corn, salami, basil, onions, mozzarella, and olives in the salad and drizzle it with Girards Champagne Dressing. It’s really a piece of cake to make! 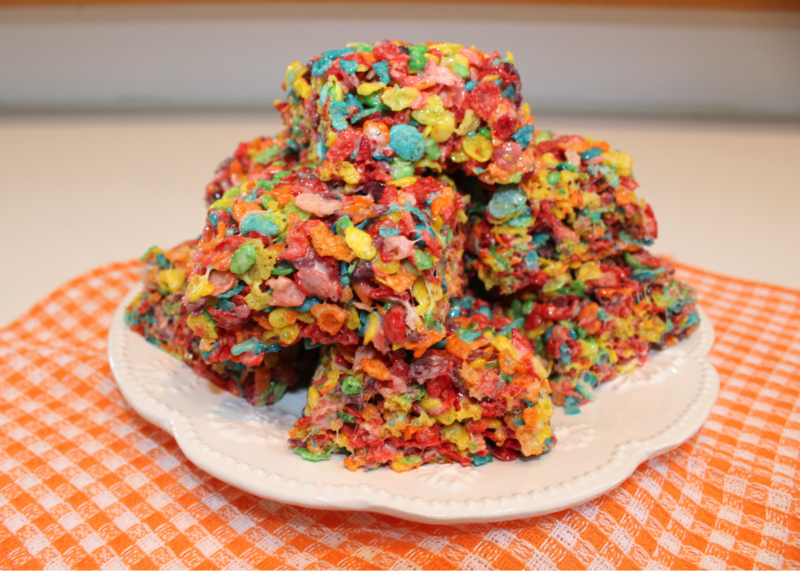 You make these just like rice krispie treats. Melt 3 tablespoons of butter in a big pot. Add an entire bag of marshmallows (I like to use the mini ones) and stir until melted. 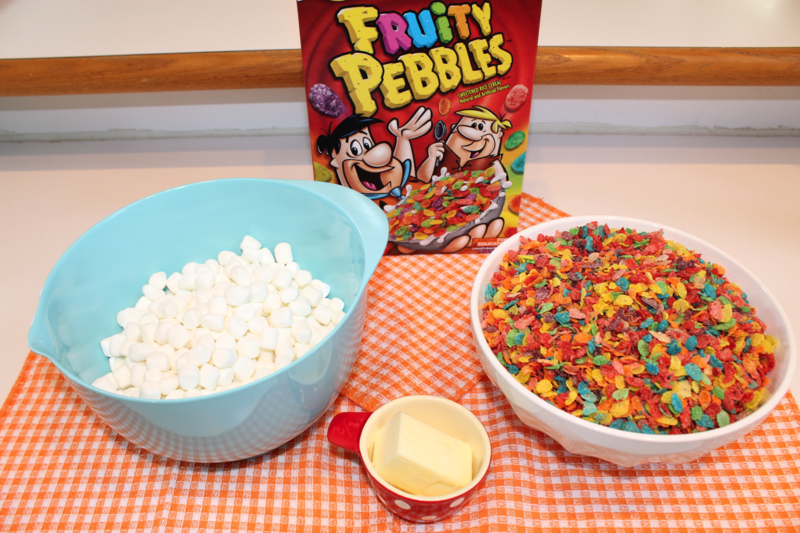 Remove from heat and pour in the entire box of fruity pebbles. Stir until evenly coated. Then, evenly press the mixture into a greased pan. (Tip: it helps to butter your fingers before pressing so the mixture doesn’t stick to your fingers) Allow to cool. And finally, cut and serve!